As an agile coach, helping people, teams, and organizations reach their change goals makes me happy. I succeed when they succeed. However, despite my best efforts, sometimes they don’t achieve the desired growth and change goal. Change is hard, especially for complex organizations where multiple teams must work together. In fact, studies show that 70% of all organizational transformations fail. What makes change happen? What influences the successful growth towards the desired change goal? Recently, one of my colleagues (thanks Enrique Zschuschen) showed me an easy model and suddenly all the puzzle pieces fell together. This model shows a change triangle that visualizes the success potential of a change initiative. The triangle shows how “fertile” the soil is for the desired change seed (initiative) and provides an indicator for its growth. 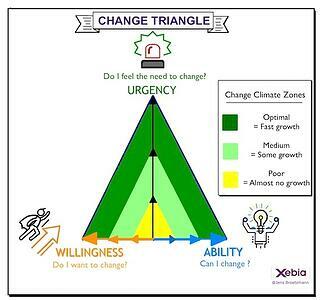 The change triangle consists of three components (sense of urgency, willingness, and ability) and three change climate zones (optimal, medium, and poor). The higher the score on the three components, the better the growth conditions, the higher the chance for a fast and successful change. The lower the score, the more likely the change won’t occur. If you can’t raise the sense of urgency, increase the willingness, or improve on the required capabilities, your change seed will dry out and die. 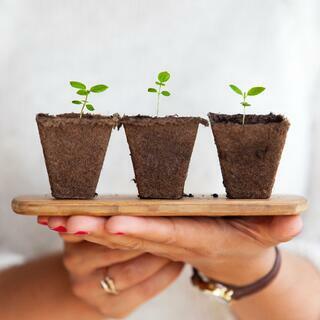 Are you sowing your change initiative in a poor or optimal change climate? Let’s find out. The Change Components – What Influences Change? Let’s have a closer look at the three change components. 1. Sense of Urgency: Do you feel the need to change? Very often managers think that communicating the reason for the change initiative (e.g. becoming more agile, productive, efficient, etc.) is enough. However, the way the people who need to change perceive it in their hearts is far more important. Is the reason strong enough to make people start moving? For example, let’s assume you want to live a healthier lifestyle. You’ve recently gained some weight and you know that more exercise would be good for you. Your conscience tells you to change your behaviour right away, but in reality, you find your living room sofa more comfortable than the gym (☺). Then, during an annual health check, your doctor informs you that you will face serious health problems within two months unless you change to a healthier lifestyle immediately. Obviously, you will feel a higher sense of urgency after the doctor’s visit. It’s the difference between knowing and feeling the sense of urgency. Before you went to the doctor, you thought that you needed to change, after the visit you felt that you needed to change. It doesn’t matter if the sense of urgency is triggered internally (intrinsic motivation) or from the outside (extrinsic motivation). What counts is that people feel that they need to start moving. 2. Willingness to Change: Are you willing to change? This represents the desire to grow, the openness to change, the ability to accept new experiences, and the commitment to do the necessary steps. A high sense of urgency helps you to get started but it takes willingness and commitment to reach the change goal. In our health example, it means that you are open to the advice of the experts (such as doctors, fitness trainers, coaches, etc.). Additionally, you also understand what it takes to make it happen, make a realistic and specific plan of action, then actually do it (for instance, going to the gym twice per week and cutting out sugar and junk food from your diet). 3. Ability to Change: Can you develop the necessary skills for the change? The ability to change is showing that you know how to put your knowledge into play or practice. First, you need to gain the required knowledge (e.g. by training, coaching or reading books). It helps you to better understand the context and to learn theoretically what needs to be done. However, the most important part is if you are able to put the knowledge into practice and start developing the new skills. In our example, you can receive a fitness training by world’s best personal trainer but if you are not able to transfer this knowledge into action, it is useless. How fast this process goes is also dependent on previous experiences and your interest/connection to the subject. In our example, if you have done already sports as a teenager, the step to reactivate and build on it later will make the skill development easier. If you do not like sports and have not had any previous experiences, it will be more challenging. In the example below, you will find a change triangle analysis of two teams (Blue and Red). 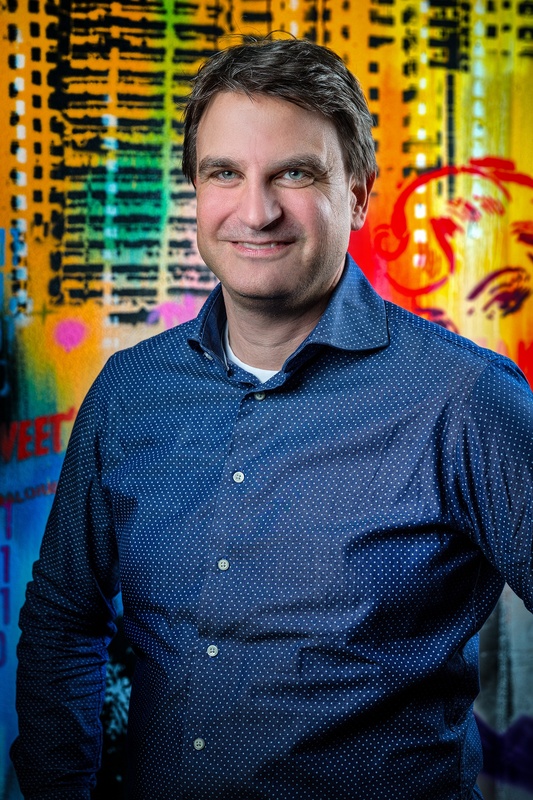 The change goal for both teams is to increase productivity, and to improve quality, predictability, and employee satisfaction. Both teams are part of the same organization and will use the Scrum framework to achieve the change goal. The teams were given scores from 1 (low) to 10 (very high) on each of the three change components (sense of urgency, willingness, and ability). The following graph shows the results. Team Red landed in the weak change zone, while Team Blue fell in the optimal change zone. To determine the probability of change success, compare the surface of the blue with the red triangles. 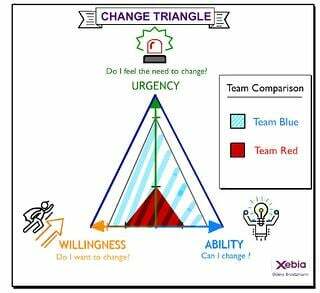 As the blue triangle is approximately three to four times larger than the red one, it means that the transformation of the red team is far less likely to be successful and, even if so, it will roughly take three to four times longer. But do keep in mind, this is an indication, not an exact science. If you cannot raise the urgency, increase the willingness or improve on in the requested capabilities for Team Red, your change initiative will dry out and die. Filling in this simple model helps you determine and set realistic expectations right from the start of your change initiative. It visualizes what influences a successful change and provides you with a metric to discuss with the relevant stakeholders. You can use it in the context of coaching individual persons, teams or organizations. Here at Xebia, we use this model successfully during the intake of agile transformations. Make your own Change Triangle and let us know what you experience! If you have any questions or need support for your initiatives to become agile, please email me or give me a call.